One day, about six years ago, I was walking my dogs in the woods and talking to myself (a favorite pastime). While this sounds peaceful and lovely, I was actually pretty wound up. I had been in business for a number of years at this point and I could not figure out why I was feeling so stuck and unable to grow the business in the ways I knew were possible. Even worse, I could see that many of my clients were experiencing a similar kind of stuckness in their own work. This made no logical sense to me because they, like me, were passionate and experienced experts in their fields. The thing is, I knew that what I was teaching were the very best tools, skills and strategies in public speaking and core messaging. I knew my clients and I were crafting powerful speeches with really compelling messages. I was also absolutely certain that sharing our messages through speaking was a powerful way to grow a thriving business and make a meaningful impact in the lives of others with our messages. Some of my clients were doing amazing things with their speaking. But too many of them weren’t actually sharing those messages – or weren’t sharing them very far and wide – and, if I was completely honest, I wasn’t either. Why not?! So on this walk, I decided to figure out once and for all what was going on. What was in the way of these awesome messages and speeches making the impact in the world I knew they were meant to make? I asked myself (yes – out loud in the woods): “What is the difference between my clients who take their awesome message and speech and immediately start speaking and changing lives the way they intended and those who don’t? What do the successful ones have that the others do not have? Then, because this is how conversations go, I answered myself out loud in the woods. And in the next 15 or so minutes, the following list of “difference-makers” tumbled from my mouth. I swear, I didn’t even try to make them all start with Cs. Since that day, I have tested this now “model” on every speaker I have met, worked with and studied. This is what every high-impact speaker – what I also call a Thought Leader speaker – has that allows them to make the biggest difference with their message. A desire for clarity is the most common reason people come to me initially as a speaking coach and a messaging coach. They have an idea of what they want to say – the stand they want to take – but they don’t know how to say it most powerfully, so it has the greatest impact. They often have an idea who they want to serve with this message – their ideal audience and/or client – but are wavering on whether to focus on that particular client or audience. Most of them struggle with the belief (not totally unfounded in many cases) that everyone would be better off hearing this message and acting on it. Without crystal clarity on the exact stand we take and who most needs to hear this message, our message will lack vibrancy and magnetism. To flourish in our work, our message needs to call the name of specific people and promise to help them with exactly what they are struggling with. It is deep work getting to this kind of clarity – and it is absolutely critical to our success as high-impact speakers. Here’s the truth: being a speaker, a messenger, a high-impact leader around your area of expertise is hard work, and it’s not always fun. Of course, you know this. Yet, our desire to serve others with our expertise must surpass the frustration during those tricky times. Known thought leaders who are high-impact speakers are in it for the long haul. We see and hear them often, advocating on behalf of the difference their work makes in the lives of others. They show up, even when they aren’t feeling totally into it or when they are struggling through their own issues. Our consistency and willingness to keep showing up, even when it’s hard, is one of the biggest difference-makers in our ability to serve with our message in a meaningful way. Commitment is a bit tricky to nail down. I know this because it was my biggest issue when I ran my own work through this 5Cs diagnostic test on that same walk in the woods. I realized that, while I cared deeply about the work I was doing, my commitment to making a difference over the long haul hadn’t been there. My frequent fantasies of throwing in the towel and working as a barista as our local coffee shop was just one point of evidence 🙂 So was my back and forth habit of putting my business in the “back seat” to other things I had going on in my life, like cross-country moves and caring for kids and family members. We earn trust from our audiences and those we serve through consistent sharing of our knowledge and expertise. Simply put: we keep showing up in ways that serve, no matter what. If you are completely honest with yourself, have you been wavering on commitment to sharing this message far and wide? Caring is about personal connection and alignment with the message you are sharing. Do you feel deeply connected with both the message you are sharing and the people you are serving with your message? There are a number of ways to connect to that kind of caring, but the most useful one is to get very connected with the people you’re serving with your message. How can you make their life better with the information you are sharing? For example, if your job is to update your team on the project you are working on and you aren’t really that into the content of your project, then focus on your team. What can you share about your project that makes their jobs easier or more productive? Focusing on the people on the other end of our message is a fast-track to caring, regardless of the actual content. 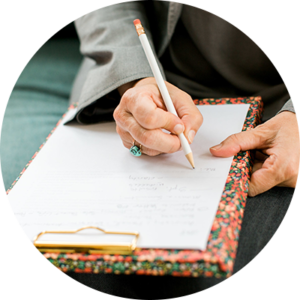 Among my entrepreneur and business owner clients, I work with a lot of coaches and wellness experts. They definitely care about their work and the people they serve – it’s a very personal mission. However, even these clients can get out of alignment and disconnected from a strong sense of caring. This often happens when a business coach or mentor suggests that they use a specific business model or make a shift in their focus in order to be more successful. For example, a health coach who has been a stay-at-home mom who started her business because she spent years of her life feeling exhausted and sick. When she learned she had food allergies and how to eat differently to address those allergies, her whole life changed. She wants to share this message with other moms who are struggling with the same problem. 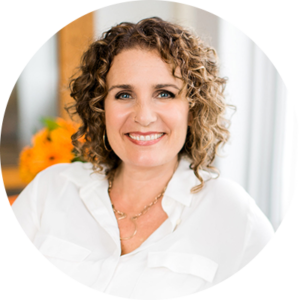 Her new business coach tells her that corporate programs are the way to make the most money, so she shifts her business to speak to corporate women. Only, that is just not where her heart is – so her energy wanes around sharing her message because she’s not speaking to the women she most wants to serve. Even a small amount of misalignment can make us resist sharing our message. So do a sincere check in: “Am I completely and wholeheartedly aligned with my message and who I am serving with this message?” And if the answer is “no” in any way, it is essential that you get back into full alignment. Confidence can feel like a nebulous word, so I like to break it down into competence and conviction (two more C words!). For our purposes, confidence is both something you feel and something your audience experiences from you. In both cases, it comes from feeling grounded and competent in your expertise and from an expressed conviction about the value of that expertise in the lives of others. When we aren’t feeling competent on a topic area our audience feels a lack of confidence from us. This is largely because we feel a lack of confidence in ourselves. Please note: I am not suggesting that you need another certification or academic degree in your topic area. I have seen way too many brilliant people hide from the spotlight because they are concerned they don’t know enough to call themselves “expert.” If you have hard-earned life experience, you have solved this problem for yourself – or if you have experience helping others solve the problem they are having, you are ready to shine that light and knowledge on the lives of those who have yet to learn what you now know. That said, learning and growth helps us grow our impact even more. If you notice there is an area of your expertise where more learning and growth would help you serve better, go for it! Just don’t let formal training and book-learning get in the way of helping real people solve real problems. First of all they need you – and second of all, there isn’t a class, workshop or book out there that will teach you what your clients will teach you. Serve, serve and serve some more. This is the greatest path to confidence. The other half of confidence comes from conviction about the value your expertise has in the lives of those you serve. I’m sure it’s obvious that the best way to stay connected to this sense of value, is to serve and serve often. This is also the place where a regular re-connection with why you are doing this work will serve you well. Often your own story is a powerful reminder of your why and emboldens your conviction. Revisit your own story and the stories of your clients often. Competence and conviction live there. Ah Charisma – the gift that only a small percentage of our population is born with. The make or break, natural-born difference for great speakers – right? In fact, the kind of charisma that helps us be high-impact speakers is the kind that lives in all of us. Truly – every one of us has the ability to connect with others in a way that magnetizes their attention. That is what charisma is really all about – it’s magnetism. It comes from an authentic connection to our audience – one in which they feel seen and known. This kind of other-focused connection is at the heart of real charisma. But being other-focused is not enough to make you charismatic. Often the biggest thing blocking our authentic confident expression is speaking anxiety. So one of the most effective ways to connect with our own natural charisma is to manage our speaking anxiety. The next level of tapping your authentic confident expression is getting clear and even naming your most natural speaking style. There is power in labeling – it can help us be even more who we want to be. Here is one quick way to tap into your natural speaking style. Think about the last time you had a really fun conversation with friends or family. Notice how you were being in that conversation. This is a quick example of you interacting at your most comfortable and confident (otherwise you wouldn’t have enjoyed it so much). What words would you use to describe that way of being? How can you use those words to help guide you in your way of approaching your next talk? Okay – there you have it. These are the 5Cs of high-impact speaking. If you aren’t getting out there with your message, if you know you want to speak or you’ve been speaking on smaller stages and afraid to move up to the bigger ones, use this list of the 5Cs as a diagnostic tool. Is there one area that needs attention so that you will feel excited and ready to get out there in a big way with your message? Here’s the bottom line about being a truly high-impact speaker: we can have the most powerful message and the most well-crafted speech and still have very little impact. It is who we be as speakers that instills the confidence and trust in our audiences. And from that place of confidence and trust, we can serve powerfully and in ways that have a lasting effect on the lives of our audience. That’s high-impact speaking that matters.